Winston by Christophe Pillet is an exclusive piece of furniture inspired to traditional Chinese furniture, discreet and mysterious from the outside, but full of surprises, details and qualities inside. A modern box of wanders: in fact, previous details like the mirror bottom and inserts in leather and metal are revealed when opening the doors, designed to contain bottles and glasses in their thickness. 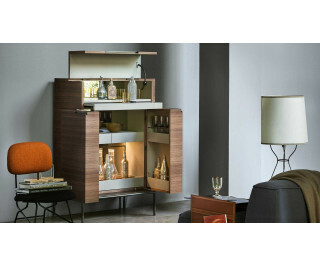 Super-equipped, the internal compartment features bottle holders, drawers and extractable compartments. Above, the flap door hides a second space with extractable surface, that can be used as support to prepare cocktails. The light suspended base is in bronzed metal while the panels are characterised by the elegance of the Canaletto walnut texture.